I love making fabric flowers and I am always hunting for new ideas in the online tutorial community. Since I have learned so much from other's tutorials, I thought it was time to share one of my own. I was looking for a way to make polished-looking flower pins for coats and bags that didn't require a lot of time, and this is what I created. I found my first piece of ultrasuede by chance at the Economy Shop, a local thrift store. I didn't know what it was at first but I knew that I had found something wonderful: soft texture, lovely color, thick enough to hold it's shape, and - best of all! - no fraying when cut! I thought it was regular faux suede and I was disappointed when I ordered faux suede online only to find that it frayed just as much as any other fabric. I did some research and came up with Ultrasuede, but it is very expensive by the yard. So I was very pleased to find the Etsy shop 3crafties, which sells packs of ultrasuede packs in a lovely range of colors. I'd stay away from the 1 inch strips, but anything larger should give you enough to make a range of petal sizes. I also have a local resale and re-upholstery shop which saves me scraps when they have them (and they give them to me for free! ), so that's another good place to look. I usually use 6-7 petals per layer and I like the look that 3 or more layers give to the finished flower. I often use a larger size petal for the two outside layers and a smaller size petal for the inside layer, but you should play around with this to see what you like best. Once you have your petals cut out, cut a small slit from the bottom of the petal to about 1/3 of the way up the petal. Hold the petal shape in place and stitch it shut. You could probably use a dab of hot glue to hold it closed if you don't want to do the stitching. I've found that sometimes the different sides of ultrasuede have slightly different textures, so make sure that you have all the petals curved with the same side up. Take out the 3 x 3 square of felt or ultrasuede and lay out the bottom layer of petals in a circle. I usually pin and repin the first round of petals until I get a shape I like. 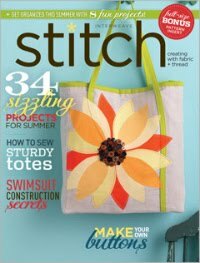 Now you need to sew the petals to the backing with a running hand stitch. After you have the first layer of petals sewn, pin and then sew the second layer. Finally, pin and sew the last layer. Now you can get creative with the center of the flower. I use a scrap of felt or ultrasuede cut into a circle, a strip of pinked felt rolled in to a circle, and/or a button to finish off the center of the flower. You can thread or hot glue to attach the center to the flower. Turn the flower over so that the backing faces up. Trim off the felt or ultrasuede, being careful not to cut through your stitches, so that the backing is now a circle. Don't worry if this isn't pretty - it will be covered up in a moment. Cut the second square of felt or ultrasuede into a circle the same size or slightly larger. If you want to add a label, sew in on the circle now. Heat up your hot glue gun and glue the second circle on top of the flower backing. Use hot glue to attach the brooch pin to the backing. And you are done! Here are some examples of flowers I have made this way. If you have questions, please leave a comment. If you want a flower pin but don't want to make it, check out my Etsy store to see what I have in stock or contact me for a custom order. Enjoy! 3 comments on "Free Sewing Tutorial: Ultrasuede or Felt Flower Tutorial"
Wow! These flowers are beautiful. Thanks so much for sharing. I'll actually be making some flowers from felt on Thursday at the Craftsy Meetup in Austin. I'll be sure to pass your tutorial along. Thanks so much! Claire - You are so welcome! I'm glad you like them and I'd love to hear how the flower-making goes. I hope you have fun at your Craftsy meetup!